•Print slide 1 – enlarge it if you wish. This can be placed in your classroom or on your travel cart. 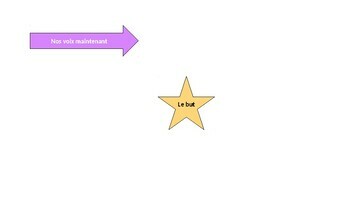 •Cut out the star and the arrow. These will help your students know what level they are at but have a goal level if they are not obtaining that level. You can use a brass fastener to attach the arrow. 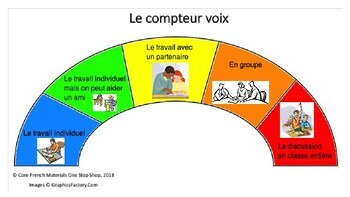 •Make sure students understand each level. •Blue: individual work. No talking or helping any students. If they need help, they must raise hand for teacher help. •Green: Individual work. If a student needs help, they can raise their hand for either teacher or another student to help. Or they can quietly go ask a friend for help. As soon as help is given, they return to their spot and working quietly. •Yellow: partner work. Partner means 2 people only. You do not work with other partner groups. Volume should be a whisper. •Orange: group work (numbers determined by teacher). 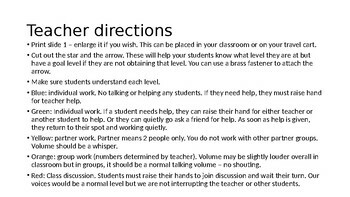 Volume may be slightly louder overall in classroom but in groups, it should be a normal talking volume – no shouting. •Red: Class discussion. Students must raise their hands to join discussion and wait their turn. Our voices would be a normal level but we are not interrupting the teacher or other students.